Meet Snowflake, the little magic Pengikin. He is called Snowflake because his eyes look like brilliant snowflakes. He is a Pengikin - a magical creature from the South Pole that is part penguin and part animal with big, round ears. He travels from the south to the north pole in search of adventure. He loves to eat muffins, especially ones with chocolate chips. I made Snowflake using yarn and a crochet hook. Regular readers will remember that I started crocheting a couple of years ago after attending a crochet workshop. The beautiful Sky Blanket was my first big crochet project. Next were some hats and scarves for family. 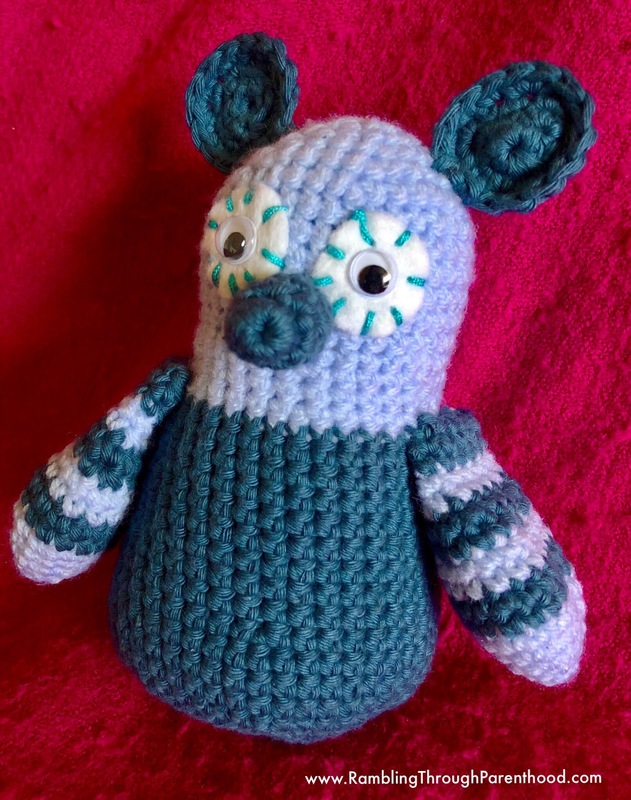 Always in search of a challenge, I decided to branch out into amigurumi. 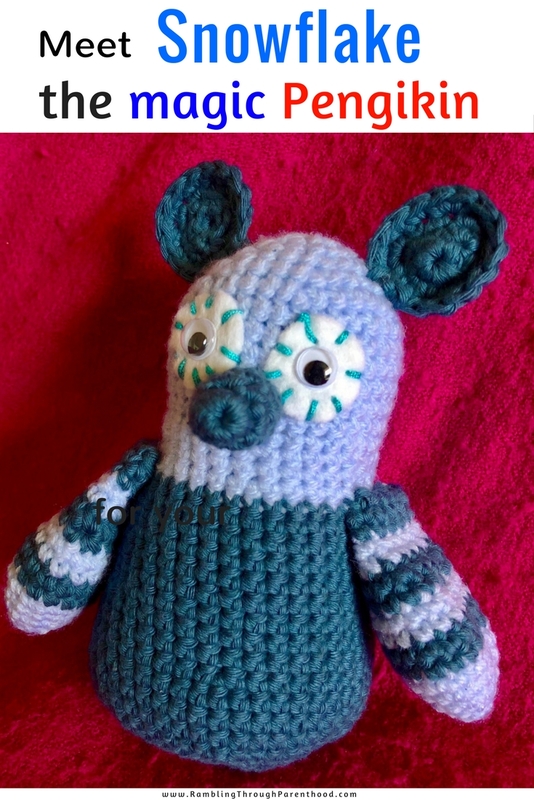 Amigurumi is the Japanese art of knitting or crocheting small, stuffed yarn creatures. Snowflake is my first time crocheting an amigurumi. 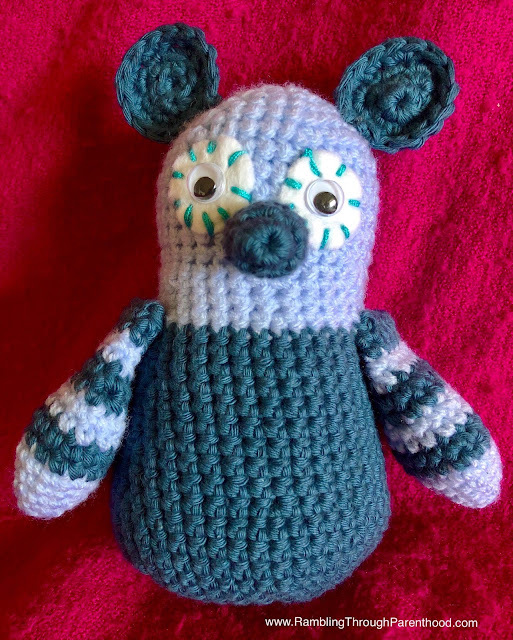 He was meant to be an owl, a Christmas present for my son, based on this gorgeous pattern. But I ran out of stuffing, and with Christmas Day looming, I decided to improvise. The result was something that looked like a penguin but had large round ears like a fennec fox and a stubby snout instead of a beak. My son didn’t seem to mind at all. All the things that I saw as wrong, he found adorable. He fell in love with the creature almost instantly and christened him Snowflake for the eyes that he adored most. I had no idea I was making snowflakes when I sewed them on. But J saw them for what they really were. “Look, Aai. His eyes are like snowflakes! All white and with eight arms,” even though one had nine. Oh, to see the world through the eyes of a child. The innocence, the imagination, the ability to spot beauty in the most unsightly things. We got chatting about Snowflake and J came up with this whole story about what he was and where he lived. We thought of all the adventures he will have and how other little children might like to find out about them. For Snowflake is always looking to have fun, exploring new places and trying new things. You can now join in his adventures. Just follow the hashtag #snowflakethepengikin on Instagram and on Twitter for more stories of this cute little Pengikin.